Before we even begin to look at the Test match played at Murrayfield on Saturday, we need to set the record straight. Obviously some people have not been following Scottish rugby….. Maybe they have not been following rugby itself? Scotland were unbeaten at home (Murrayfield) in 2018. They beat France 32-26, they beat England 25-13, and they beat Fiji 54-17. In 2017 they beat Australia 53-24 in November, and also ran the mighty All Blacks very close, losing 22-17 on the 18th November. They also beat Italy, Canada, and Argentina away from home in 2018. Yep, they have lost some Tests too, they went down 34-7 to Wales in February 2018, and they lost 28-8 to Ireland at Lansdowne Road in March. They lost to the USA in Houston, 30-29 in June, with a team composed mostly of second-stringers. They also lost 21-10 to Wales on the 3rd November. The point that I need to make, loudly and clearly, is that this Scotland team are very difficult to beat at home, and they can and will give you a run for your money away from home too. Those that expected Scotland to be a walkover were clearly not following the game of rugby with a modicum of attention. The game itself was a thoroughly enjoyable experience. 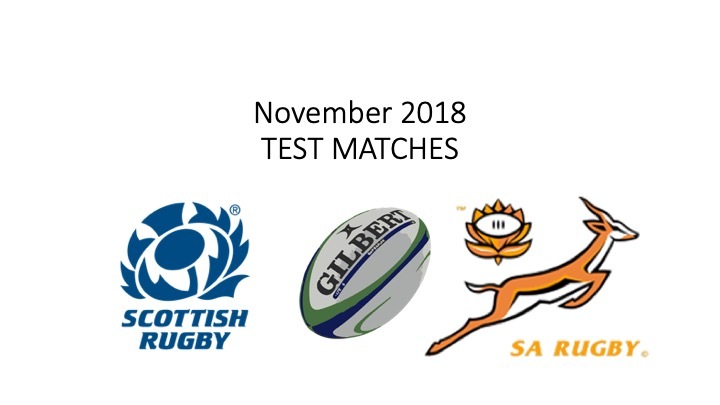 Two teams that had a full go at each other, the Scots playing with fire and a certain exuberance, while the Springboks played with similar fire, yet slightly more composure and focus than their hosts. Throughout the first half, a see-saw affair as the teams stayed close on the scoreboard, it was the Springboks that played more constructive rugby while the Scots played the opportunist “organised chaos” game introduced and nurtured by coach Gregor Townsend. The Scots played their free-running game, probing for weaknesses in the South African defence, while the Springboks played a more direct, structured game, looking at creating opportunities with good, clean ball in the Scottish half of the field. The difference between the two sides was evident in the way the Springbok defenders got off their line quickly and efficiently, to smash the Scottish ball carriers back time and again. The Scottish game thrives on momentum, and the Springboks simply denied them the opportunity to build that momentum. Yes, the Springbok defensive system creaked a couple of times. Both wings were at fault for charging in off their channel a couple of times – a system encouraged by their defence coach, Jacques Nienaber, but one that requires discipline as the midfield needs to be aware of the intent and then quickly shift out to cover the hole. On a couple of occasions the wingers shot in off their line, forcing the midfielders to scramble, an indication that the winger’s decision was not fully communicated to his support. Despite the glitches in the defensive system, it was evident that the Springboks wanted to stifle the Scottish enterprise and prevent them from playing their free-running game. From a Springbok perspective then, it was mission accomplished. Mostly. Another pleasing aspect of the Springbok game was their own patience, composure, and enterprise in the first half, together with the maturity and nous to pull down the shutters and change the entire flavour of the game in the second half. In the first half, the Springboks played with more attacking flair than some had expected, with some superb moments, sublime touches, and beautiful moments. Handré Pollard’s try was one of the very best of the season, while Jesse Kriel used his power to run a direct line and simply smash through the Scottish defence for his score. They were two well taken opportunities that came after the Springboks had used some direct rugby and positive pressure to build the momentum that resulted in their scores. So much better than a week ago. Not perfect, of course, there were still far too many attacking mistakes and moments when the wrong decision was taken. At the end of the first half, my brother set a message on our family Whatsapp group, saying that he thought that the Springboks were playing the better rugby, while the Scots were scoring on breakaway opportunities. He was correct. The Springboks were playing the more constructive rugby, but they could not prevent the irrepressible Scots from having a go whenever they got the ball with a little bit of space to move. A thought that kept niggling in the back of my mind was that the Springboks were playing up-tempo rugby throughout the first half, and that the fatigue of an immensely long season would start to kick in, probably in the second half. This was inevitable, and we have seen the tempo slow and stutter in each of their two previous outings. However, this time it seemed that the Springboks knew that they had to change their game and focus on lasting through to the final whistle. In response, they changed their game plan, deploying Plan B, and shut down the game and the Scots, stifling them just when it looked like they might be able to step up another gear. In my reviews of the previous two Tests, against England and then against France, I suggested that the Springboks were still lacking in maturity as they seemed to either panic, choke, or get a bit frantic as the game progressed. Perhaps I need to amend that suggestion slightly. In this Test the Springboks showed that they are learning their trade! They way they played the second half certainly shows that they are learning from previous mistakes and experiences, and that they are growing in maturity! When Willie le Roux was given a grossly unfair yellow card by referee Romain Poite, it was probably the most crucial moment of the game, perhaps even of the Springbok’s entire year. With 14 men on the field and under pressure by a Scottish team desperate to earn some reward on the scoreboard, the Springboks could have panicked, they could have succumbed to the pressure. They could have folded. With 14 men, they probably had their best spell of controlled rugby in the entire game. They maintained possession and simply ground Scotland’s game to a halt. Greig Laidlaw’s penalty brought the Scots level, but that was it for Scotland. They scored no more points in the second half while the Springboks quickly went back in front through the boot of Handré Pollard. Lest we forget, the Springboks might have been a further six points ahead if Handré Pollard had maintained his metronomic accuracy with the boot. Somehow he missed two penalties that he would have expected to goal on any other day of the week. From another perspective, it was the Springboks’ superior physicality that eventually ground down the Scots, stifling their game and suffocating their enterprise, extending the Springboks’ winning run at Murrayfield to three matches and wins over Scotland to 6 consecutive victories. South Africa have been struggling to find some depth in the scrumhalf position for a while now. If Faf de Klerk is not available for some reason or another, the scrumhalf shelf in the “Spares” cupboard has seemed a little bare of late. Based on his performance in this Test, that shelf is no longer quite so empty. Embrose Papier certainly passed his test as a starting scrumhalf for his country. Sure he made some mistakes, some of his box kicks went too far, and some were slightly misdirected, one that went straight up in the air cased a couple of problems, and a couple of opportunities to snipe with the ball might have been missed, but he can be very happy with a solid performance that belies his 21-year old rookie status. His service was crisp and accurate, and his defence was as gutsy and direct as that of Faf de Klerk. South Africa have found a scrumhalf. Rassie Erasmus has taken some flak with regard to his use of substitutes during recent weeks. Sometimes the substitutes have not had the desired impact, sometimes commentators have felt that he waited too long before deploying one or another sub, at others he was criticised for sending on a substitute too soon in a game. The criticism became so loud that even Jake White was moved to comment, saying that there is no exact science in the use of subs. This week there can be no doubt that the Springbok substitutes all made a contribution to the final result. Each came on and did exactly what he was supposed to do as the Springboks played clinical rugby and closed out the match. Perhaps only Ivan van Zyl made no real contribution as he only had three minutes on the park. But, critically, he also made no mistakes. November 2018 has not been a great time for the referees and match officials on the international panel. Far too many errors, far too many blatantly incorrect decisions, and far too many decisions that could and did directly impact on the result of a Test match. This Test again produced its fair share of refereeing errors and inconsistencies, as well as a couple of real howlers. In the 45th minute, Romain Poite yellow-carded Willie le Roux for a “deliberate knockdown” when it looked to one and all that Le Roux was going for the intercept. Poite, with the able assistance of his fellow match officials decided that Le Roux’s actions were a) deliberate, and b) that he had no realistic chance of catching the ball. In their view, therefore, it was a “deliberate knockdown” and worthy of both a penalty and a yellow card. Somewhere, and somehow, the coaches and players of the game of rugby have to stand up and object to these “homemade interpretations” by the referees. The definition of a “deliberate knockdown” has been completely perverted by referee interpretations that are well wide of the written Law. It seems, that in the view of the referees, any attempt at an interception that fails, is now somehow worthy of a penalty and in most cases a yellow card too. In a game where we encourage flair, excitement, and opportunism, an attempted interception is, according to the referees, either a brilliant piece of play – if the intercept is successful, or an indiscretion worthy of a sending off if it fails? From anyone’s perspective there is a clear distinction between a player that sticks his hand out to prevent a pass from going down the line, and a player who actually attempts to catch the ball. Willie le Roux clearly went up to intercept the ball, managed to stop it in the air, and then failed by the smallest of margins to regather the ball. If he had caught the ball, it was a certain try for the Springboks. He could not manage to pull off the trick, so he was sent to the Sin Bin! And not the first time Mr Poite has dished out a card to a Springbok that was simply wrong! Remember Bismarck du Plessis’s tackle on Dan Carter? Far too many mistakes and weird interpretations by a referee who is considered good enough to control Test matches? Of course, this was not Mr Poite’s only error in the game, there were many others. Another that went against South Africa was in the 76th minute of the game when South Africa were on the attack and pressing hard, with the possibility of another score if the ball was recycled quickly at the breakdown. As Embrose Papier went to retrieve the ball from the ruck Scottish No.7 Hamish Watson made contact with him from an offside position, and without the ball. This happened directly in front of Mr Poite, who was watching the ruck closely. Two penalisable offences in one. Offside, and playing the halfback without the ball. Mr Poite missed the offences completely, and then at the next breakdown was called back to the point of the breakdown by the TMO Ben Skeen, where he penalised Pieter-Steph du Toit for clearing Watson out dangerously! Did Mr Skeen also miss Watson’s side-entry offside and playing the halfback? If Mr Poite had been doing his job, there would have been no need for Du Toit to get involved at all. Of course, Mr Poite’s mistakes did swing both ways. He, and his officials completely missed the incident where Siya Kolisi made contact with the head of Scotland centre Peter Horne as Kolisi was being held on the ground. Kolisi may well be cited for this incident and miss the next Test against Wales. I must also question the three on-field officials for their policing of the offside line in almost every moment of this Test. At times an entire back division could be seen to be a meter or two offside, with not so much as a “get back” wave by the referee and zero intervention by his assistants. In the modern game where the rush defence has become the staple of almost every team, allowing the defenders an additional meter or two is contributing to stifling the game which is already becoming more and more static as backlines cannot run with any freedom at all. It is time for the Match Officials to step back from trying to dictate the way rugby is played. This was a Test match played the way all Tests should be played. It was entertaining, full of excitement, enterprise, and sublime moments, those two reverse passes by Huw Jones were brilliant, the smooth glide through the gap by Handré Pollard was special, the bravery under the high ball by one and all, the power of Duane Vermeulen, the tussle between the front rowers, the commitment and the fury. In the end the team that showed the better control, superior tactical nous, more physicality, and the coolest heads was the winner, and that was the South African Springboks. Some great defensive work, great under the high ball, and some accurate tactical kicking. Harsh yellow card. Made some enterprising incursions into the backline, gave the pass that sent Pollard away on his try-scoring run. Not enough chances with the ball in hand, with just four runs and one clean break. Could have made more of a superb kick by Papier, but did not gather cleanly. Was exposed on defence too easily. Made 4 tackles, missed 1. Rock solid on defence, made seven tackles and missed just 1. Ran straight and hard, making six carries, although he was again just momentarily slow on the pass. If he could time his pass just a tiny bit better, the scoring opportunities are there. Powerful burst for his first-half try. Made a couple of very good turnovers, and carried the ball 6 times for 16,. He was marked by Huw Jones who was not giving his old teammate an inch, which shut De Allende down somewhat. One very good tactical kick. A great back-tackle on Huw Jones prevented a possible try. Not his best Test. Did not get much chance with the ball in hand, and made some really silly defensive decisions. Knocked a high ball. Just two carries in the game. Made two tackles. Keeps getting better and better as the game manager and leader of the back division. Simply looked in control every minute of the game. Some really good moments with the ball in hand, his break gave the impetus to the play that ended with Kriel’s try. His own try was as good as it gets. Made 10 carries for 47m and two clean breaks. He slotted his first five goal kicks before missing two in a row, and made six tackles, while missing two. One or two mistakes, but overall the Man of the Match award was well deserved. Should have had the jitters, but did not allow them to show on the field. Some really crisp passing, and some fair kicking, although this aspect needs work. Had some chances to snipe around the fringes but did not, probably under instruction to be conservative. Made 6 tackles, missing 1, carried 3 times for 28m, and made 80 passes. A good first start! Thormeulen at his best. Massive work rate, both on defence and in the collisions. Made 3 great turnovers, and seven massive tackles. Strong under the high ball, and solid in the lineout too. A couple of great carries. Carrying, tackling, clearing, harrying, and disrupting the Scots all day. Ten massive tackles, a lineout steal, and 12 carries. His pace around the park is almost unbelievable for such a giant of a man. A massive influence, again. Shook off the fatigue that has plagued him of late, and produced one of his better performances of the year. Won a couple of turnovers, made 10 tackles, 4 carries, and was especially good on the cover defence. Very good counter-rucking, which has become something of a speciality. An open, running game suits him! Still seems just a tiny bit lightweight in the carry, seven carries that were all stopped, but then he made more tackles than anyone else in the Springbok team – 13 in all – and was always present in the hard stuff. Good lineout management. Maturing as a Springbok, he is avoiding the off-the-ball moments that have been a hallmark of his year. Great defensive display, and good in lineouts. One very good carry and offload. Needs to learn the value of a lower body angle on the carry. Massive effort by the reliable quiet man. Solid scrummaging, great tackles, a couple of good carries and one knock on. Penalised for a really silly side entry to ruck when Springboks were a meter out from the Scottish line. Made four solid tackles. Seemed to be running out of legs when he was subbed in the 66th minute. Made 8 of his 9 lineout throws count. With good work rate and his usual nuisance value over the ball. Carried the ball 5 times for 15 meters. Made 6 tackles, but missed 2. Seems just a tad subdued, which is probably a fatigue issue. Another massive shift by the big fellow. Scrumming was powerful and impressive as he got the better of WP Nel. Great ball-carrying with a special moment in the lead up to the first Bok try. 6 carries for 21 meters, made 7 tackles, and missed 1. Good lineout throwing, making all three count. Great defence. Carried the ball 3 times. A good day at the office for the super-sub! Won a great turnover and forced a penalty off Adam Hastings. Carried the ball once, made two tackles but missed 1. Solid scrumming. Solid in the scrums carried the ball twice, made two tackles, but missed 1. One really great run in support play, and a superb cleanout. A good shift, if not yet fully match-fit. Won 2 lineouts, carried the ball six times and made two tackles. Valuable experience off the bench from 66th minute. Three carries, two tackles. Nuisance over the ball. When he is relieved of the pressure he has so much more fun on the field. With Pollard calling the shots from the 12 berth, Jantjies can play his natural game, taking on the defence lines and probing for chinks in the opposition line. A couple of good clearance kicks, one brave take of a high ball. Could have done with more time on the field. Better on defence than the man he replaced, he had a couple of runs in his short stay. One very good tackle and a really impressive run. Some superb counter-attacking, he is at the heart of Scotland’s running rugby revival! Huge kicks drove the Boks back time and again. Not a great day. Missed 2 tackles but made 7. Had no chances with the ball in hand, just 2 carries for 9 meters. Did not go looking for work. Best of the Scottish backs, with a point to prove against many old teammates. Tested the Springbok defence, and pulled off two superb switch-pass offloads. 8 carries for 127 meters, made 5 tackles and missed just 1. Put superb pressure on the Springbok midfield in the rush defence, shutting De Allende’s space down. Six carries and 7 tackles about sums up his afternoon. Chased everything, but seemed just a little ineffectual. Got hammered in the tackle. Wonky defence plagued him got himself in positional knots, but carried the ball well. 7 carries for 64 meters, with two linebreaks. Did not dominate his opposite number as much as expected. Did not put enough pressure on the rookie. Good crisp service to his three quarters and made his tackles. Hard work on defence, and carried well with the ball in hand but was knocked back by some of the Springbok tacklers. Missed some of his own tackles. Great work on defence, often bordering on offsides. Very good with ball in hand, and a nuisance at the breakdown. Best of the Scottish forwards. Just a bit lightweight, which meant he got knocked back in the tackle a couple of times, and his own tackles were not as dominant as they could have been. A busy day, with a never-say-die attitude. Worked hard all day. Made 10 carries, but only for 29 meters as he was stopped by the Bok tacklers. Made a massive 14 tackles. Ben Who? The one Scot that seemed a little anonymous. Best I can say is that he made his tackles. Lost the scrum contest with Steven Kitshoff, and it cost him a few penalties. Missed some tackles and was generally invisible in the hard stuff. Lots of tackles, 5 in all, but missed 1. Was turned over twice. Made 6 carries but very little progress. Struggled to stand up to Malherbe in the scrums, and was all but invisible everywhere else. Got a bit carried away in trying to make the game a personal thing against the country of his birth. Got involved in off-the-ball scuffles and slanging matches. More huff than puff. Made all his tackles. Made some good tackles, carried the ball hard, but all too little too late. One good break and some crisp service. Made no tackles. Anonymous, with some silly mistakes, gave up a crucial penalty. No chances ball in hand and was exposed on defence on occasion. What as happened to the Wings in the game? The wings are trying to play the defensive role that Jacques Nienaber teaches them, but a lack of maturity and thus of communication is letting them down. They do the “dog leg” inward rush, but forget to tell their midfield that they are going in. In this system of defence communication is critical – if the midfield know the wing is rushing in, they immediately drift across to cover the hole, with the fullback either as back up or stepping in to cover the midfield. But if the wing just goes……..